The preview version of Windows 9 may be in the hands of consumers early next year, according to the latest train pulling in at speculation central. Corroborating previous rumours suggesting Microsoft will launch its next desktop and touchscreen OS next spring, one leaker has found evidence that the preview will arrive in February or March next year. The leak's supplier, known as FaiKee, claims to have obtained an internal Microsoft screenshot displaying the preview release date, which he posted on the My Digital Life forums. The screenshot bears text reading: "Windows 9 Windows Preview Release @ 2015 02-03." "If it's real (couldn't see why it isn't), then you could scrap all previous Win9 release speculations," the leaker wrote. 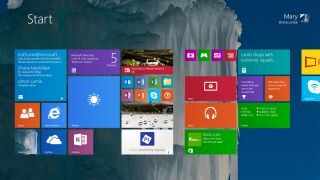 Currently, little is known about Microsoft's plans for Windows 9, although it is thought the company is embarking on a rapid development schedule with a view to a swifter release than with previous versions. Any brand new version may see further evolution of the modern UI, greater emphasis on cloud-based features, Cortana integration and, of course, the reinstated Start menu.